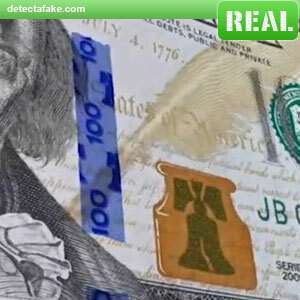 The new 100 dollar bill is designed with many 3-D feature which offers the highest counterfeit safety features to date. Below are the features to look for when taking these bills. In the pictures above, pay attention to the bells and "100" inside the blue strip. Tilt the note back and forth while focusing on the blue ribbon. As you move the bill, you will see them move. 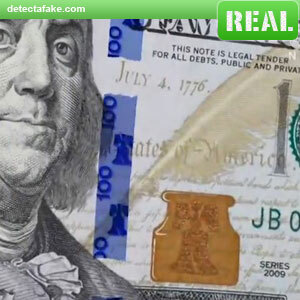 This will only happen on the real bills (unless the counterfeiters get better). You also need to look at the bell inside the ink well. As you move the bill, the color of the bell will change. Notice the color difference in the two pictures above. Next, hold your bill up to the light. On a real bill, the light will reveal a security strip that is not visible without the light. 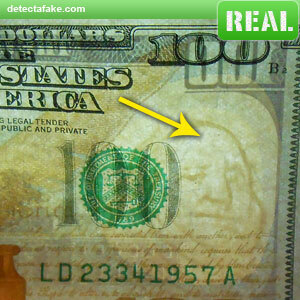 Another feature to look for on a real 100 dollar bill is the Franklin hologram which is located on the front/right. 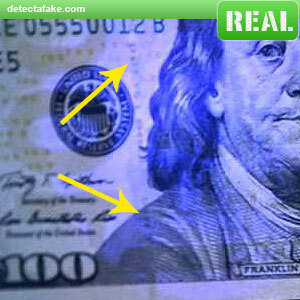 If you hold the bill up to a light, the Franklin image will appear.